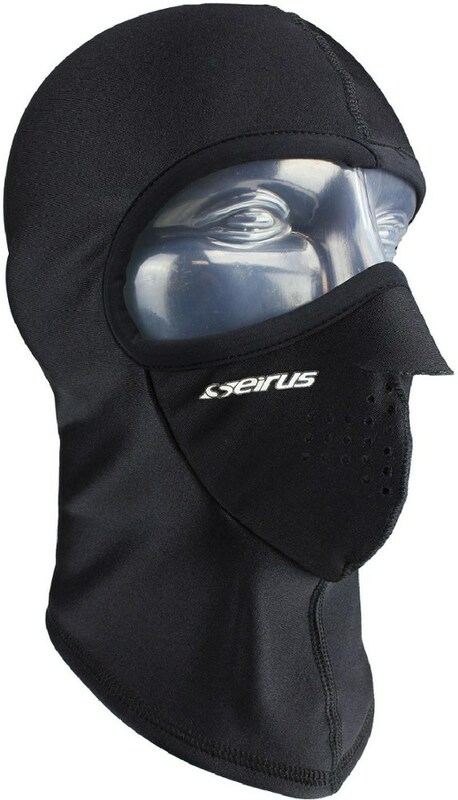 A well thought out and useful piece of equipment for really cold weather. I found this beautiful piece of history in a local thrift shop. At first glance, it looked rather peculiar. I knew it had to be old since I hadn't seen anything like this in recent history. After having inspected it, I realized that this was a functional piece of winter gear. The mask is filled with high quality goose down. 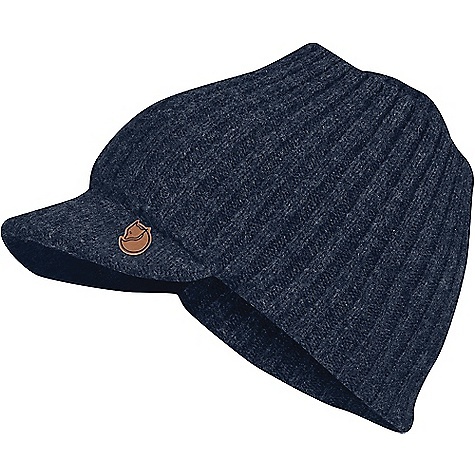 The material is a tight weave windstopper fabric. The back half of the mask is an elastic material that creates a form fit around your head. The elastic was fully intact even after 40 years. For many winters I’ve run into a tough-to-deal-with zone of temperatures here in MN. It’s the -10°F and below. At this temperature or lower, breathing becomes unpleasant to the lungs. 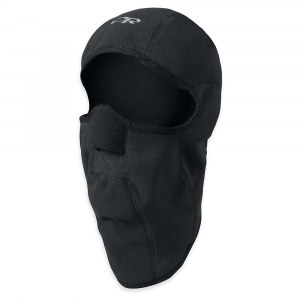 A balaclava would seem like the logical choice to mitigate the problem. It filters the airflow just enough to take the bite off of it as it enters your lungs. 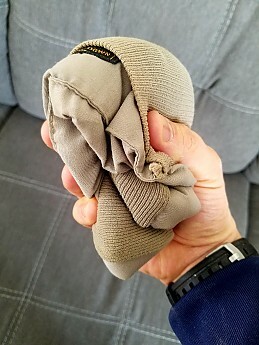 The only problem with a balaclava is that within 15 minutes, your moisture will begin to freeze onto the material that you’re breathing through. 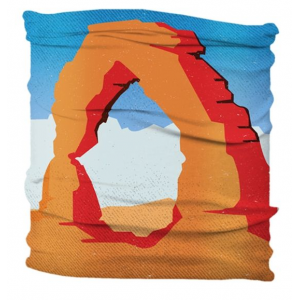 This restricts air flow and you begin to notice the reduction in oxygen. 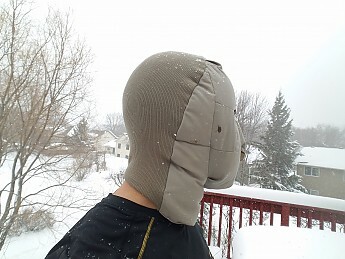 The Eddie Bauer down face mask does a fantastic job of taking the bite off of the cold air while allowing unrestricted breathing. The breathing hole is just small enough that the radiant heat trapped inside the mouth area, has the ability to tame the incoming air. Water does condense around the breathing hole and I’ve had icicles form on the nose flap. This does not however affect your ability to breath. I really enjoy how the elephant seal type nose flap fully covers your sniffer. A beard can cover your cheeks and your chin but a nose always seems to be exposed. 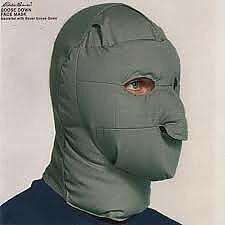 On really cold nights (-20° or lower) I wear this mask to bed. 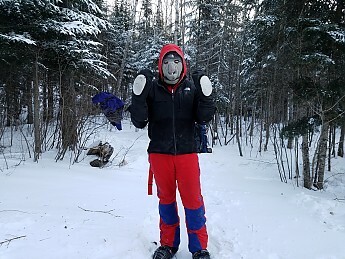 For the first couple of outings it seemed a bit irritable but then I weighed the slight irritance against a frozen face and quickly got used to it. The mask is labeled as a "one size fits all." Dubious at best. Although it does fit me, it’s snug. I think the mask would work for a smaller head because the back half of the mask is highly elastic. However, I don’t think someone with a larger head than mine would feel comfortable in it. My cap size is 7.25. Another reason why I don’t think “one size fits all” is accurate is the placement of the eyeholes. I find that they are ever so slightly spaced too far apart. Someone whose eyes are closer together than mine might find themselves cyclopsing out of one eyehole. I would guess that this mask would fit upwards of 75% of users. The backside of the mask is not insulated. Your hood or hat fits over the mask well and stays in place. Most any headlamp stays on the mask as well. I love this mask while traversing frozen lakes. There's usually a great deal of wind that blasts across the lakes. 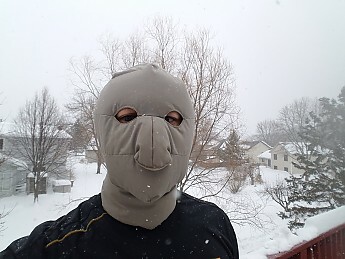 This mask blocks it really well and keeps my face warm no matter the temps. The material the mask is made of is soft enough to the skin and does not cause any chafing. It packs down to the size of a pop can. In the end, the mask performs well. It has withstood the test of time and the elasticity and materials remain in working order even after nearly 40 years. I will continue to use it for years to come on those really cold or windy outings. Ha! Totally! I originally made mention of that in my review but thought I had better be a bit more objective so Michael Meyers didn't make the cut. This thing looks like a mix of practical and what my nightmares are made up of! Haven't seen one of those in many years. Nice. I wish EB was still the company that made gear like that. They truly were "Expedition Outfitters." Scary! But cool. Kind of makes you look theriocephalous, like a person with the head of a tapir... Ganesha satyam sundaram! Cheers! The Goose Down Face Mask has been discontinued. 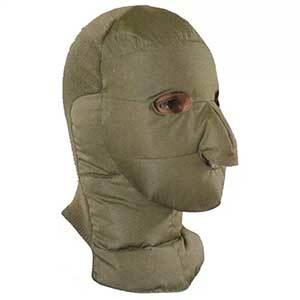 The Eddie Bauer Goose Down Face Mask is not available from the stores we monitor.